William (Aneurin Barnard) is a depressed young writer who has attempted to kill himself seven times, ten if you count the cries for help. He is in the midst of his latest botched attempt when he meets Leslie (Tom Wilkinson), a for-hire assassin who agrees to help him end it all within a week in exchange for money. But things take a turn when William gets a call from Ellie (Freya Mavor), a young woman who works at a publishing house that is interested in one of his manuscripts, and she also happens to be the girl of his dreams who gives him something to live for. William tries desperately to get the plans called off, but he is already locked into a contract, and Leslie needs to complete the job in order to meet the mandatory quota that has been put in place by his boss Harvey (Christopher Eccleston), so that he can keep his membership in an elite assassins guild. 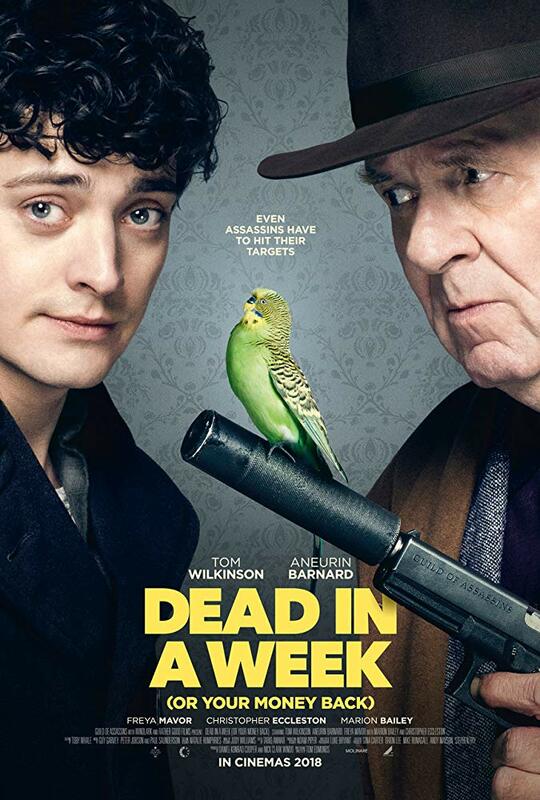 This is the gonzo premise of Dead in a Week (Or Your Money Back), a pitch black comedy from the UK that presents the feature debut of writer-director Tom Edmunds. While the story uses its serious themes to deliver plenty of dark humour, the film is also largely sensitive in its portrayal of mental illness and depression, and the romance that blossoms between William and Ellie is actually pretty sweet. This is the sort of dry, pitch black comedy that the British do so well, and the film works thanks to its performances. Barnard makes for a brooding but still somewhat sympathetic lead, Mavor does appealing work as his love interest, and Wilkinson excels at playing a goodnatured and gentlemanly hitman, who is so polite and pleasant about the fact that he kills people for money. Even if the overall story is a bit predictable, and not every element of the screenplay feels equally well fleshed out, Dead in a Week (Or Your Money Back) held my attention and is actually weirdly charming at times. While it certainly won’t be for everyone, I found this to be a mostly enjoyable if admittedly somewhat twisted little film that I would recommend to those looking for a decent dark comedy. Dead in a Week (Or Your Money Back) is now playing in limited release at Cineplex Cinemas Yonge-Dundas in Toronto.